With the arrival of the first chills in Spitalfields, my mind turns to thoughts of steaming meatballs. So I hot-footed it up the road to Bethnal Green and the kitchen of Maria Pellicci, cook and beloved matriarch at E. Pellicci, the legendary cafe that has been run by her family since 1900. Although I find it hard to believe, Maria told me that meatballs are not always on the menu here because people do not ask for them. Yet she graciously assented to my request, and even granted me the honour of permitting my presence in her kitchen to witness the sacred ritual of the making of the first meatballs of the season. For many years, meatballs and spaghetti comprised reliable sustenance that could deliver consolation on the grimmest winter day. If I found myself in a cafe and meatballs were on the menu, I had no reason to think further because I knew what I was having for lunch. But then a fear came upon me that drove away my delight in meatballs, I began to doubt what I was eating and grew suspicious of the origins of the ingredients. It was the loss of an innocent pleasure. Thus began the meatball famine which lasted ten years, that ended when Maria Pellicci made meatballs specially for me with fresh meat she bought from the butcher in the Roman Rd. Maria has worked daily in her kitchen in Bethnal Green since 1961, preparing all the dishes on the menu at E.Pellicci freshly as a matter of principle. More than this, reflecting Maria’s proud Italian ancestry, I can confirm that for Maria Pellicci the quality of her food is unquestionably a matter of honour. Maria mixed beef and pork together with eggs, parsley, onion and other herbs, seasoned it with salt and pepper, letting it marinate from morning until afternoon. Then, as we chatted, her hazel eyes sparkling with pleasure, she deployed a relaxed skill borne of half a century’s experience, taking bite-sized pieces from the mixture and rolling them into perfectly formed ruby red balls, before tossing them playfully onto a steel baking tray. I watched as Maria’s graceful hands took on independent life, swiftly rolling the meatballs between her flattened palms and demonstrating a superlative dexterity that would make her the virtuoso at any card table. In no time at all, she conjured one hundred and fifty evenly-sized meatballs that would satisfy thirty lucky diners the following morning. I was at the snug corner table beside the serving hatch in Pellicci’s immaculately cosy cafe next day at the stroke of twelve. After more than ten years of waiting, the moment was at hand, as Anna Pellicci, Maria’s daughter proudly delivered the steaming dish, while Salvatore, Maria’s nephew, brought the Parmesan and freshly ground pepper. The wilderness years were at an end, because I had spaghetti and meatballs in front of me, the dish of the season. Maria made the tomato sauce that morning with garlic, parsley and basil, and it was pleasantly tangy and light without being at all glutinous. As a consequence, the sauce did not overwhelm the subtle herb-inflected flavour of the meatballs that crumbled and then melted in my mouth, the perfect complement to the deliciously gelatinous spaghetti. Sinking my teeth into the first meatballs of the twenty-first century, I could only wonder how I lived through all those years without them. Outside a cold wind was blowing, so I took courage from ingesting a syrup pudding with custard, just to finish off the spaghetti and meatballs nicely, and restore substance to my attenuated soul. The special quality of E. Pellicci is that it is a family restaurant, and that is the atmosphere that presides. When I confided to Anna that my last living relative had died, she told me at once that I was part of their family now. Everyone is welcomed on first name terms at Pellicci’s in an environment of emotional generosity and mutual respect, a rare haven where you can enjoy honest cooking at prices everyone afford. I call upon my readers to help me keep meatballs on the menu at E. Pellicci now, because we need them to help us get through the winter, brexit, and the rest of the twenty-first century that is to come. 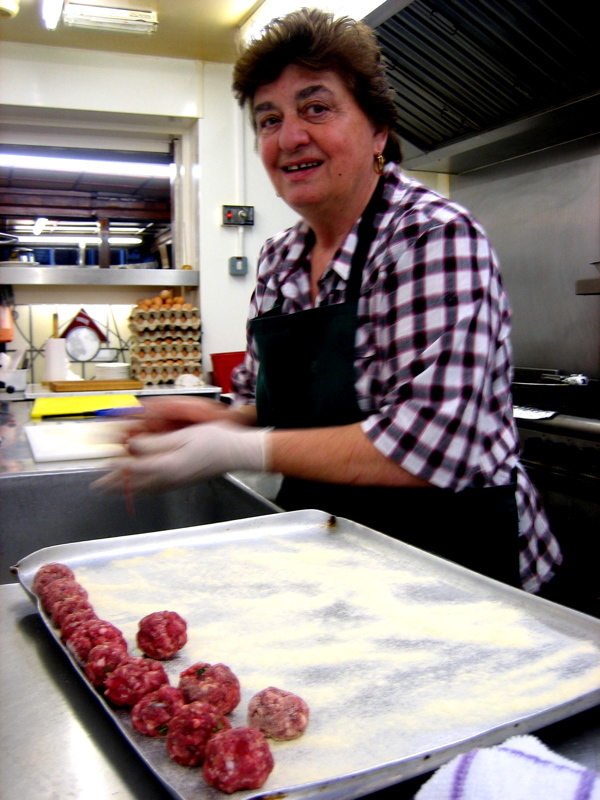 Let us send a collective message to the Pelliccis, that we love their meatballs with spaghetti, because when we have a cook like Maria Pellicci, the meatball queen of Bethnal Green, we cannot forgo the privilege of her genius. I’ll second that sentiment – if ever the British had acute need of comfort food, it’s now (‘now’ likely to endure for a further decade at least). And so sweetly ironic that it’s an Italian woman who’s helping out! 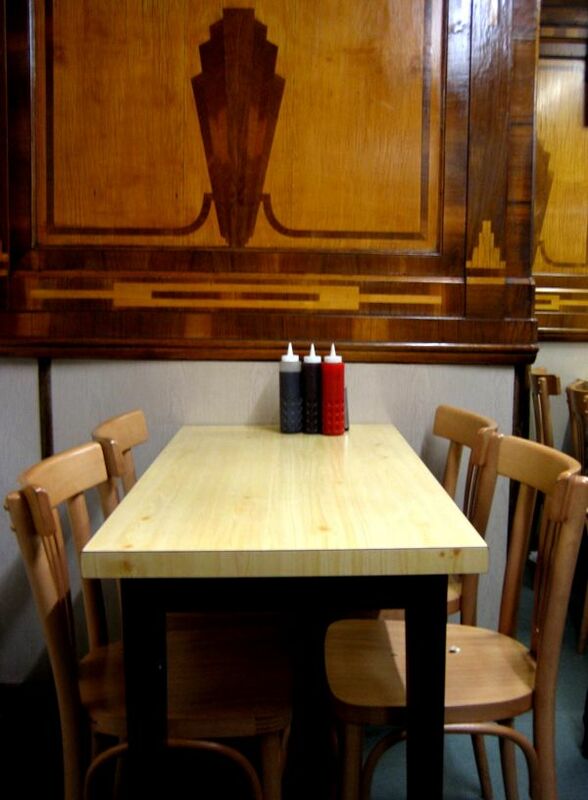 Honestly, if I ever make it to the Big Smoke…Pellicci’s will be my first stop. Every time I read about their restaurant,it reminds me of a place that my mom and dad would take us to when we went up to their hometown in Pa. (called Coney Island Lunch)…it’s been open and has not changed in just over 100 years. 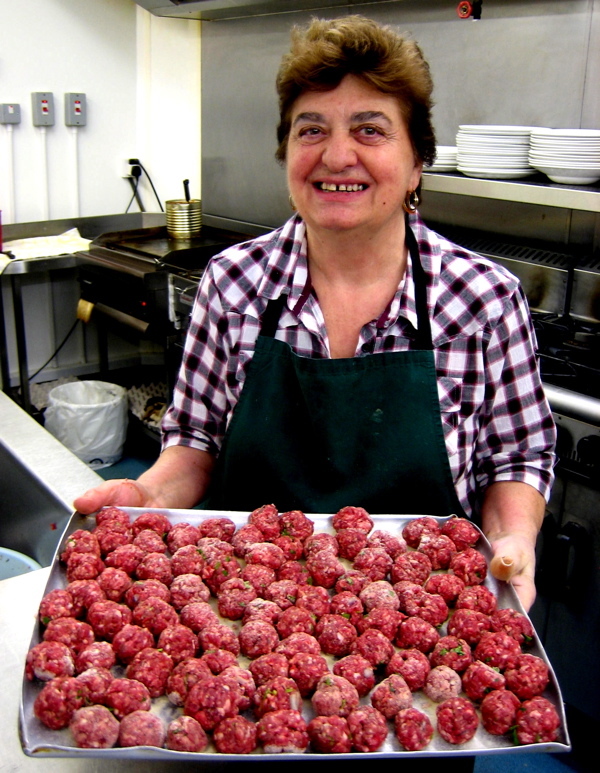 G.A.,please tell Mama Pellicci to keep those meatballs coming ,she is surely a treasure. Long ago in my twenties, on only snowy nights, we would walk to end of our street (approx 3/4 mile) to eat spaghetti and meatballs at a local Italian cafe. It was so wonderful to step in to their eatery, especially after the walk in the glowing quiet of the snow with no cars or people to break the silence. We were almost the only customers and were greeted with all the service and grace of regular customers. The food was always extra tasty because of the cold. I live in a warmer climate now and I would truly love one more chance to experience such a meal after a long walk on a snowy evening. I’ll be there this winter! I am a veggie, but this article makes me want Maria’s meatballs and spaghetti! I’ll pop by for a cuppa and something veggie instead though. It’s a splendid cafe and a real asset to our community. You just can’t beat home cooked Italian food like this. I totally support the Gentle Author’s comments. A very long time since I was at Pellicis & can’t make it now, but the meatballs sound inspirational. So my mouth is watering in anticipation & instead I have just got down my Hugh Fearnley-Whittingstall’s meat book off the shelf & will have to follow his recipe. Hope they won’t be too pale an imitation for tonight’s dinner! OMG, I can just smell the aroma of those meatballs across the ocean! My dear mother made excellent meatballs – very similar recipe – even though our family was totally Irish. She learned the skill from an Italian friend. I have been told that I do a pretty good version myself. Since Maria arranged these delights on a large try, I presume that she popped them in the oven, rather than frying them in a big pan – messy job. Burnaby BC Canada isn’t far enough to get there! They sound absolutely delicious. And Pellicci’s sounds a wonderful place – at any season, I’m sure. If only we lived nearby… but next time we’re in London, we will try to make it there. GA, your descriptions are so lovely – so evocative and full of atmosphere, and of feeling for those you describe. Your readers truly appreciate you! My favourite go-to restaurant after Don’s Cafe at Clapton Pond closed. I left the UK in 2008 but feel green with envy, not to mention extremely homesick, after reading this. A beautiful post, as usual. The question is, can I get a delivery overseas!? How wonderful. I also read the other Christmas post about Pellicci’s. This is on my list as a place that I must experience for good food and lovely people when next I’m in London.